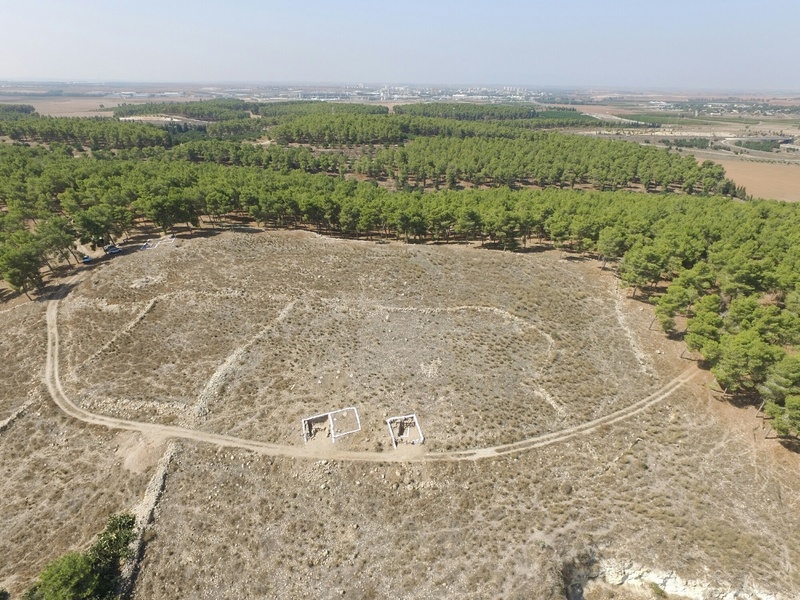 During Chol HaMoed Pesach, several weeks ago, I was told by my friend Itamar about the Khirbet Arai archaeological dig in the Judean lowlands, not far from Beit Guvrin and Kiryat Gat. I traveled down to Beit Shemesh the day prior and we went out to see The Jungle Book in theatres the evening before the dig – a great film. 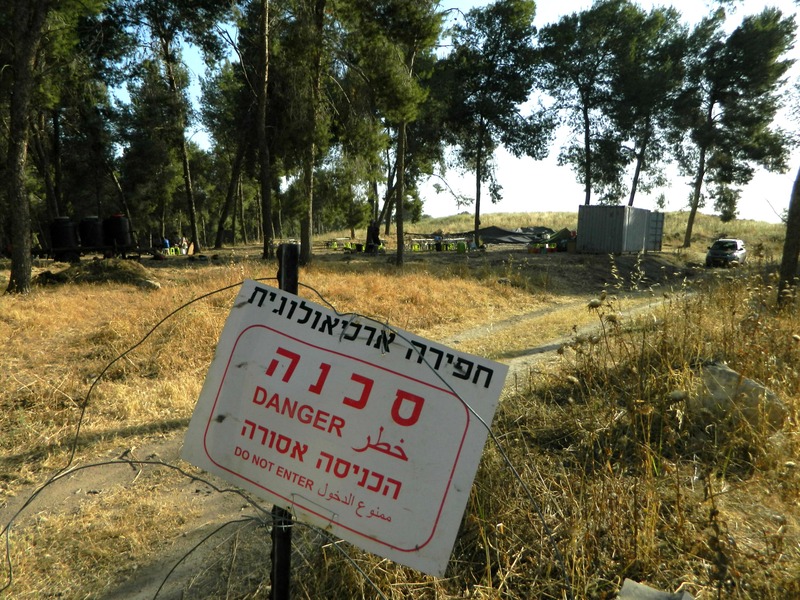 The day of the dig arrived and we were driven to the site, passing historical sites such as Tel Beit Shemesh and Emek HaElah where the iconic battle between David and Goliath took place. Beware of the archaeologists up ahead! 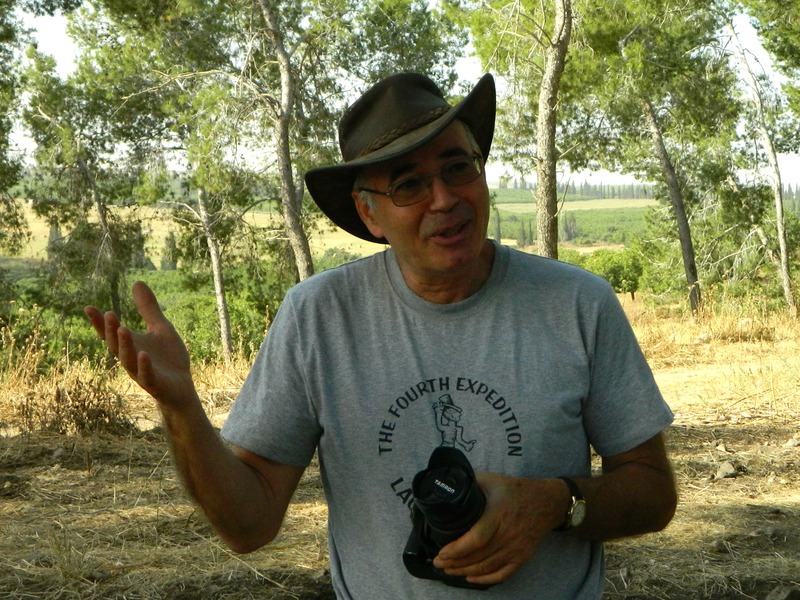 The Khirbet Arai Expedition is run by the Hebrew University of Jerusalem, under the watchful eye of Professor Yosef Garfinkel, one of Israel’s premier experts in Biblical Age archaeology. 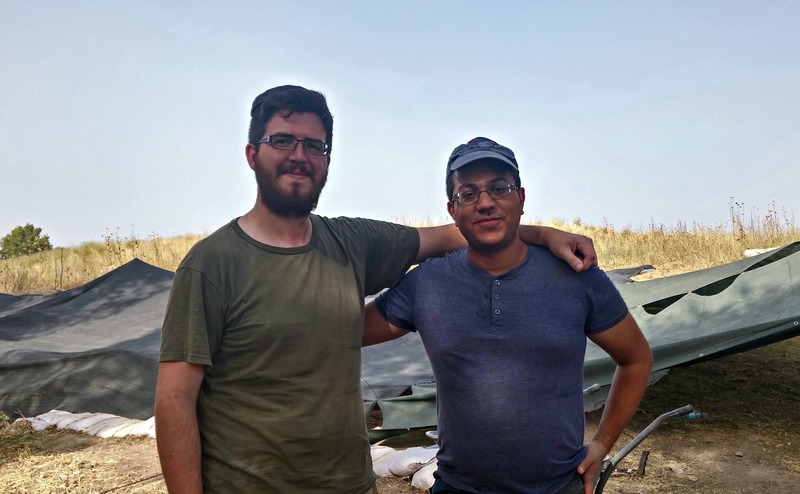 Fortunately, Professor Avraham Faust from Bar Ilan University – my boss in the lab where I work – came to visit and I was able to tag along with him and Saar Ganor from the Israel Antiquities Authority to hear a pretty extensive review of the excavations and findings. I began the day’s work by helping with labeling cleaned potsherds for future vessel reconstruction, something I have plenty of practice in working in the Tel ‘Eton Archaeological Lab back in BIU. Once we finished with the pottery bits we had lunch and then got back to work, this time I joined the diggers working in a particular square uncovering walls from either the 9th Century BCE or the 12th Century BCE, I cannot recall which was which. The periods are Late Bronze, Early Iron and Iron II – if I am using the terms correctly (I’m still a student) – which are the Judges and Kings periods of Israelite rule. 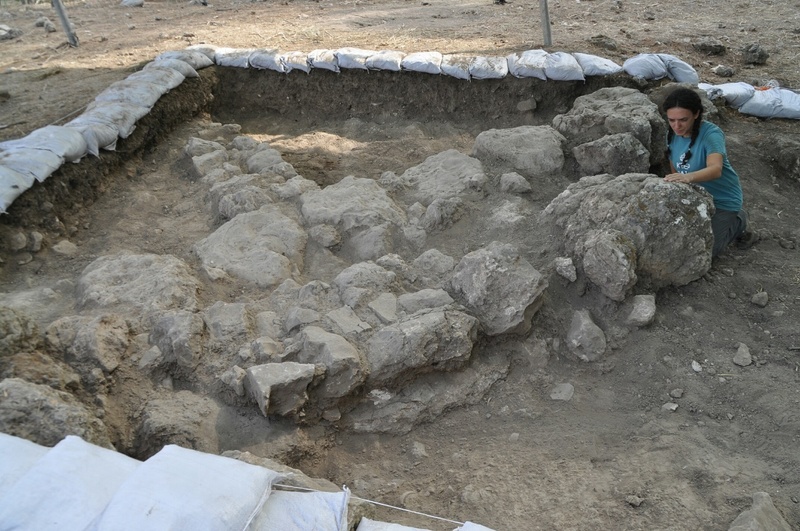 Prof Garfinkel has already done extensive excavations in nearby Lachish and Qeiyafa, larger sites from the same period which guarded over the Nachal Lachish, an important road in the region. As Khirbet Arai has only been subjected to test and minor digs thus far, we were glad to make headway into the areas we were uncovering. 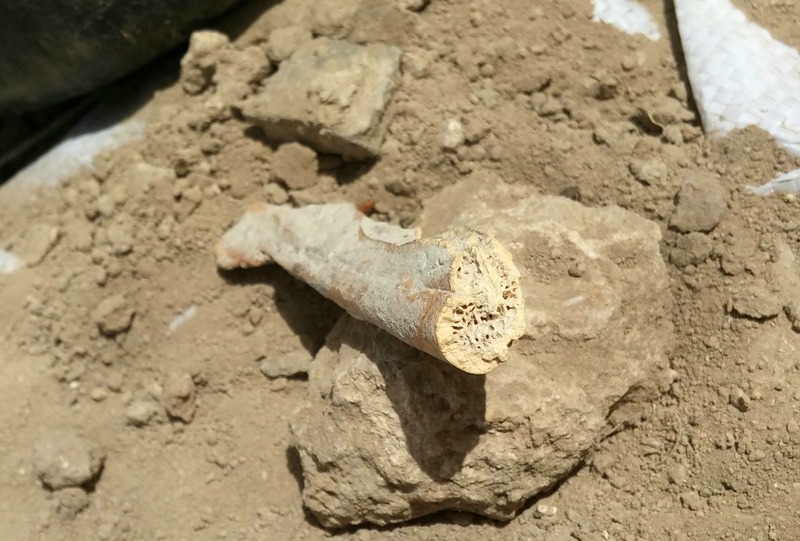 Due to the sensitive nature of new reveals in both the academic and tourism world, I was forbidden to take photos of key findings and of the dig site itself but was graciously given permission to use released photos courtesy of the Khirbet Arai Expediton. As I scraped around in the dirt between two emerging stone walls, I kept count of the potsherds I was finding – but lost track after thirty or so. 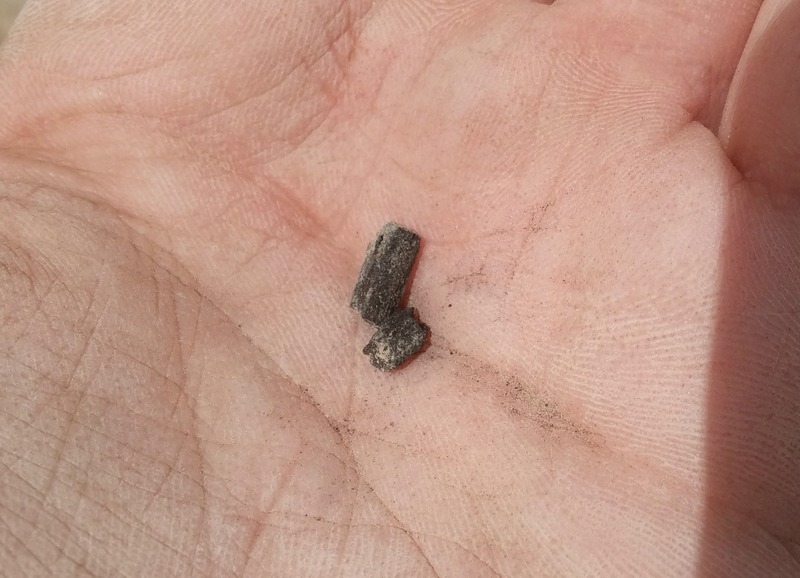 All in all I estimate that I personally unearthed some 40-50 pottery pieces as well as what looks like a broken rib bone and some burnt brick material with small amount of concentrated carbon. It’s assumed that there must have been a raging fire which left burnt traces in the pottery and the brick, possibly fires of destruction and ruin – oh how I wish I had a time machine! Noam, our square supervisor, was fun to work with and he showed us a broken flint tool and other oddities that he found on his side of the square, as well as answering the many questions that I had. Unfortunately, I blundered in my mission and was told by the Professor that I had committed an “archaeological disaster” by digging too deep alongside the wall stones, perhaps breaking the floor strata. We learn from our mistakes and at least now I know what not to do on my next dig. Towards the end of the day we closed the dig site and worked on washing some pottery, another thing I have experience in, while the washed potsherds from the day before went to the pottery reading to determine their value and usage, the rest of which was dumped alongside the dirt and stones removed from the site. I sat beside Prof Garfinkel and discussed the site with him, learning of Luke Chandler’s blog where more photos and more information can be found (see post ONE and post TWO). Another interesting fact that I gleaned was that ancient sites from this particular time period are often identified by the animal remains found. 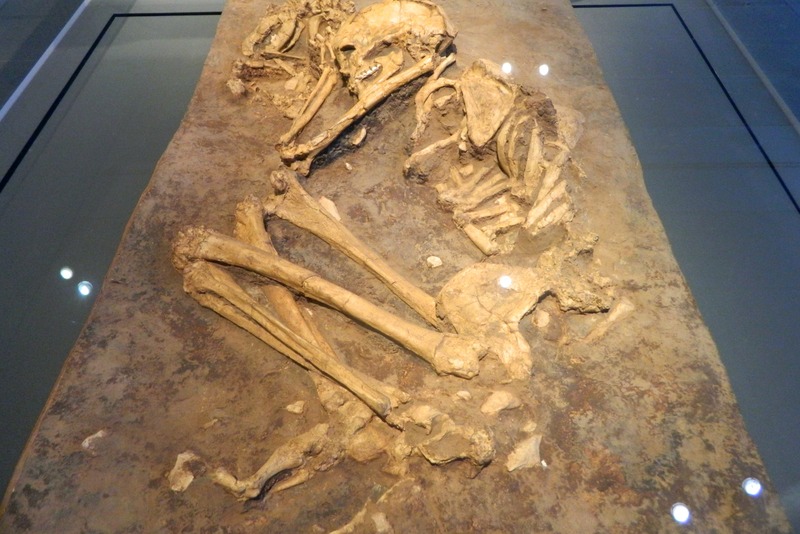 Philistine sites have been documented as containing up to 20% swine of the bones found while Jewish sites have 0% swine bones, as the pig is not a kosher animal and thus ignored by the Israelites. Finished with the pottery washing, I got a ride partway home, washing and freshening up in Netanya’s train station, before making it the rest of the way home for a good night’s sleep. A month or so ago I received an invitation to attend a special farewell ceremony for Professor Emeritus Amos Kloner of Bar Ilan University. 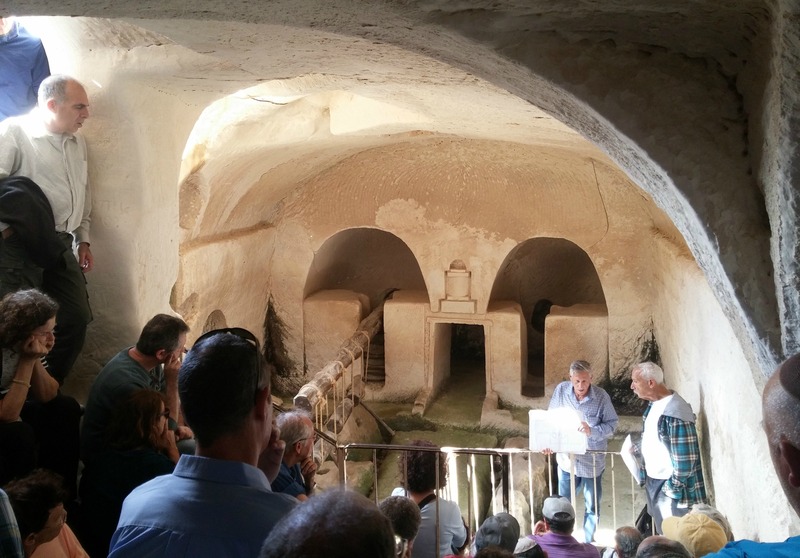 Already in his mid-seventies, Prof Kloner finished his lecturing last semester and was being honoured for his work at one of the most famous places he helped bring to life: Beit Guvrin – Maresha. I had visited Beit Guvrin – Maresha on my 12th grade graduation trip to Israel and haven’t been back to explore since, aside from a short visit to the Roman amphitheatre located nearby (HERE). And so it was on a pleasant Thursday afternoon that I boarded a bus with other university members and we made our way to the national park. 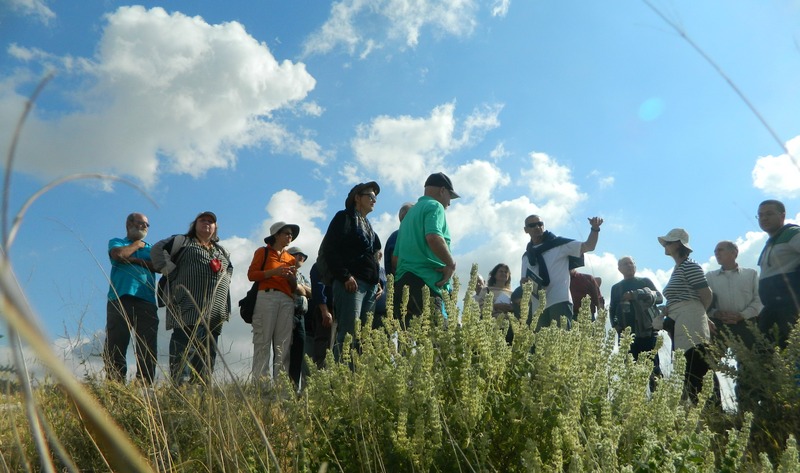 Because of Prof Kloner’s renown, the event was co-hosted by the Israel Antiquities Authority and the Israel Nature and Parks Authority in conjunction with BIU. Within the park we followed the evening’s mapped itinerary, starting with the fascinating ancient underground columbarium, or dovecote, with its capacity for thousands of pigeons or doves. 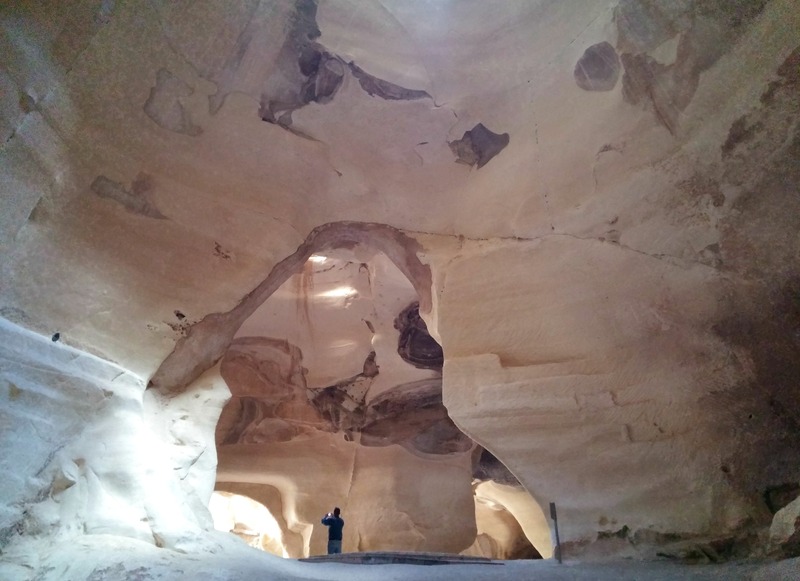 Due to the region’s soft, chalky bedrock, there are hundreds and hundreds of caves – some natural and the others man-made. To give a brief synopsis of the local history, a fortified city by the name of Maresha is Biblically mentioned as a Jewish city until the times of the Babylonian king Nebuchadnezzar II who exiled its inhabitants. 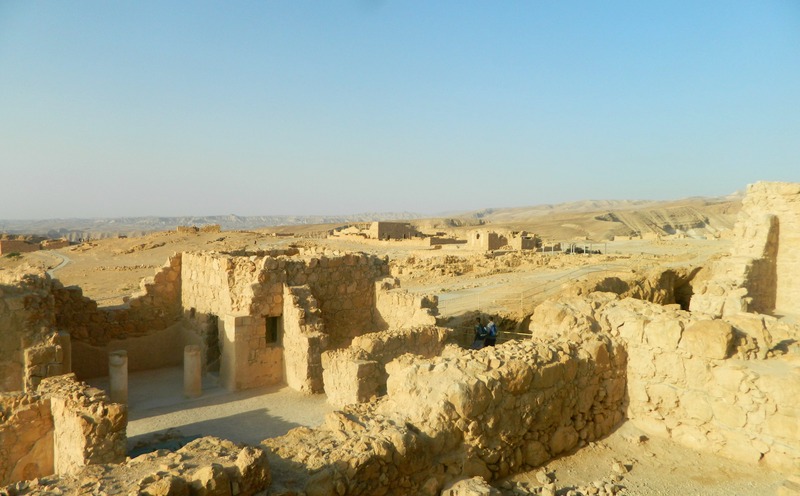 Abandoned Maresha was then occupied by the Edomites until the time of Alexander the Great when the city became the home of retired Greek soldiers. Enter the Maccabean Revolt, Pompey, Julius Caesar and then Herod and the city was destroyed in the power struggle. 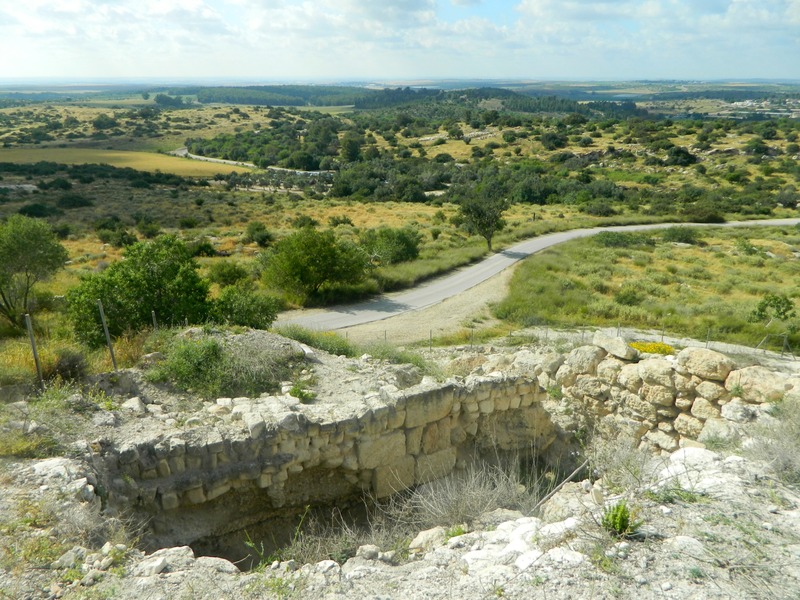 Still in the Roman period, the small Jewish settlement of Beit Guvrin nearby became a regional replacement of Maresha and was named Eleutheropolis by the Romans after being conquered by Vespasian. 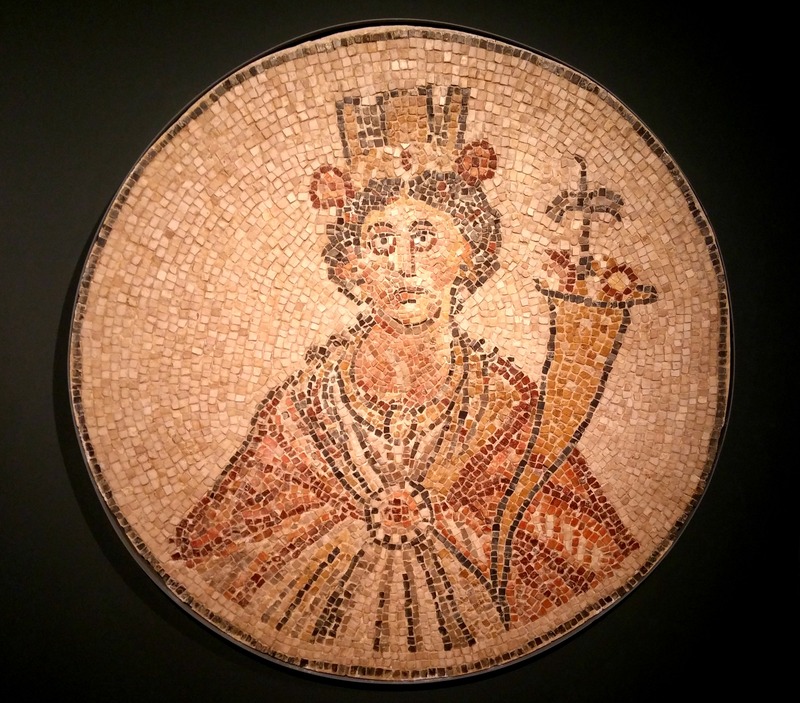 Uncharacteristic of Holy Land cities, the ancient history ends with the Romans, save a few scattered instances of settlement throughout the following two millennia. As we climbed out of the columbarium I bumped into future tour guide Haike Winter and her friend – always fun to see familiar faces in unlikely places. 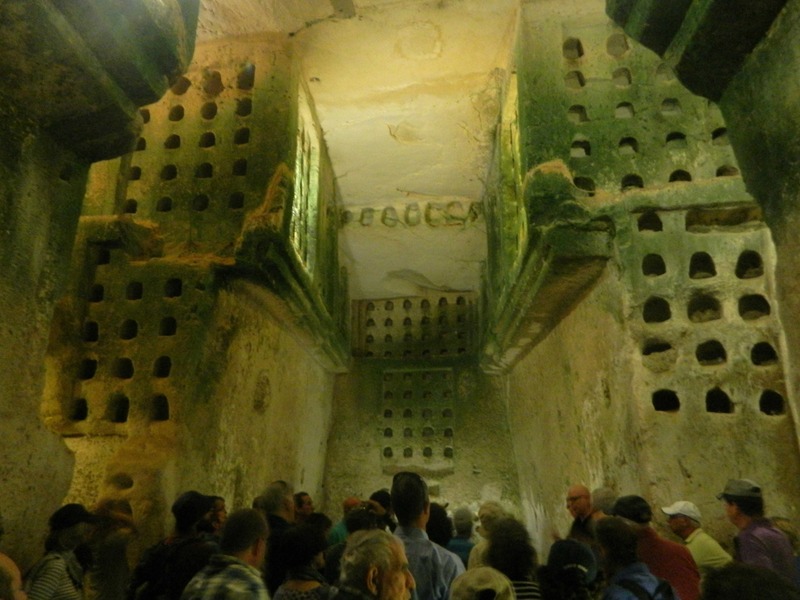 The next site on the map was the water cistern and olive press, both carved into the soft rock underground, where we heard a brief lecture on theories regarding Greek influence and involvement during the time of Alexander the Great. Climbing out, we continued on to mount Tel Maresha, where a guest lecturer hailing from Caesarea came to speak. There we stood gazing at the lay of the land, listening to the pastoral sounds of a flock of sheep passing down below. 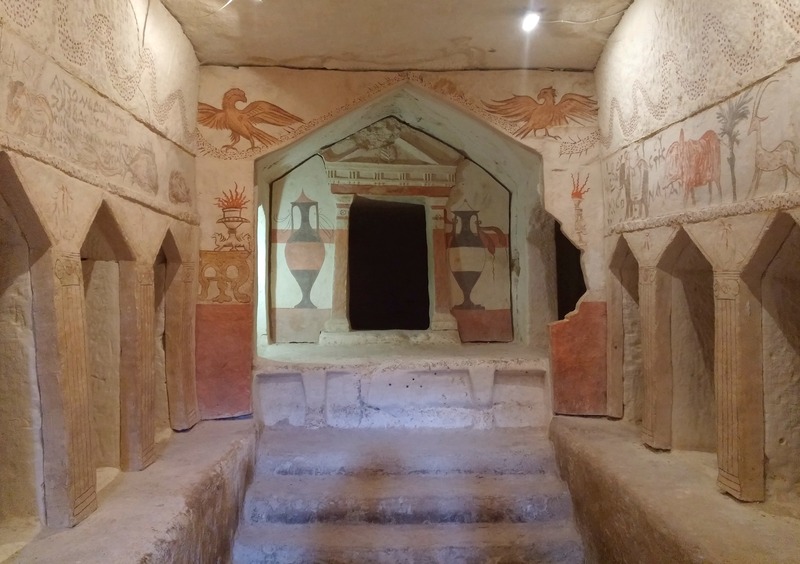 The next place we visited was the famous Sidonian burial cave with its imaginative paintings, known as the Apollophanes Cave, a place I remember from my trip in 2008. I was overjoyed to see the painting of a wild boar alongside other wild animals such as antelopes, giraffes, elephants and more. 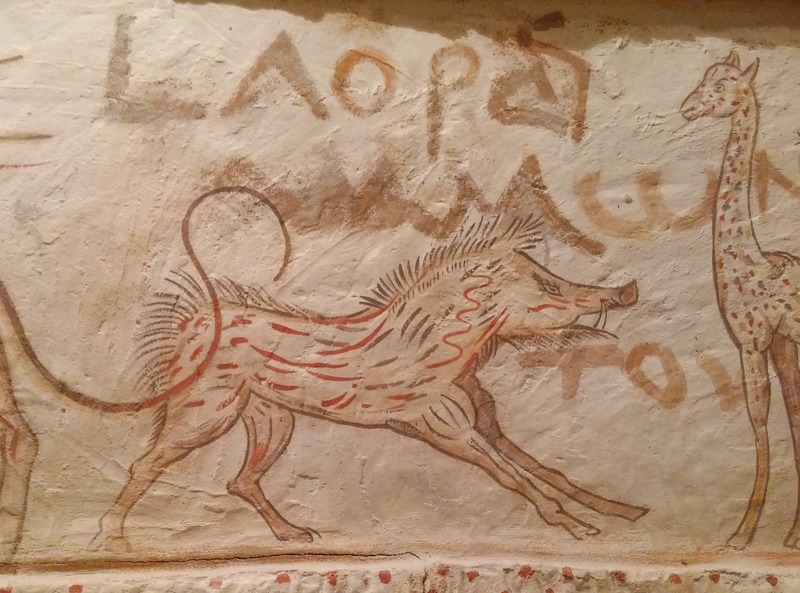 Ever since my run-ins with the ferocious and savage swine in both Nachal Kziv and Nachal Ga’aton I have been excited to see inanimate representations in ancient art. From the Sidonian burial cave we boarded the buses to visit the famous Bell Caves where the ceremonially academic evening of lectures was to take place. Food and beverages were served yet I preferred to photograph jackdaws and to then visit the Bell Caves before the crowds arrived. During my 2008 visit we neglected to visit the Bell Caves so I was duly impressed to see the huge chambres, hewn from soft chalk, to be used mainly as quarries during the Byzantine era. There were a few other people wandering around the caves as well and I used them in my pictures for perspective, to gauge the height of the large bell-shaped caves. When I had completed my subterranean tour I joined the rest of our group at a nearby cave where chairs and a screen were set up for lectures. Settling down next to my friend Itamar, I listened to the speeches and took notes on what everyone spoke about. 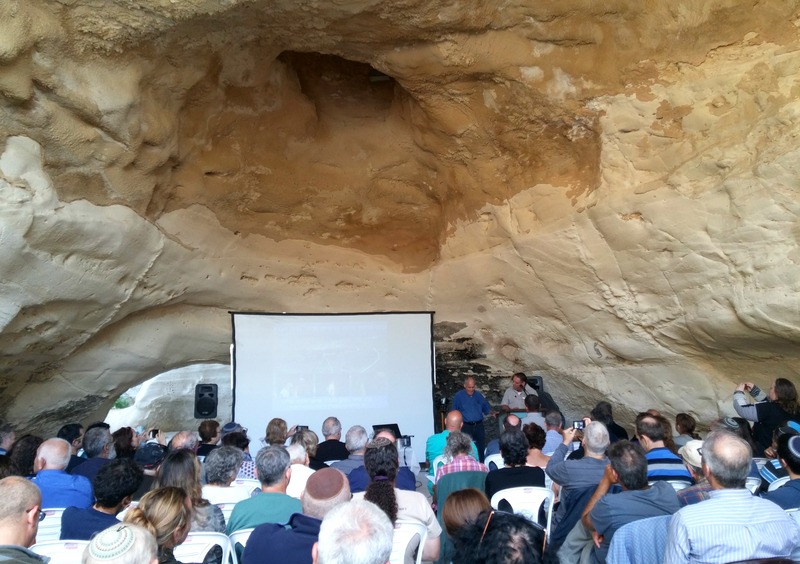 Dr Tsvika Tsuk of the Israel Nature and Parks Authority spoke about being a soldier and finding a sarcophagus, and then the story of the recent victory getting UNESCO to recognise Beit Guvrin – Maresha as a World Heritage Site. Dr Ian Stern of Archaeological Seminars told us about interesting findings such as items used for magic and ancient cultist practices. Dr Adi Erlich from Haifa University showed us slideshows of clay idols or figurines found locally, putting emphasis on one particular idol of Cybele – unusual to see in the Holy Land as Cybele was an Asia Minor deity. Prof Esther Eshel from BIU provided us with knowledge on ancient documents found inscribed on clay tablets while our department head Prof Boaz Zissu gave us a general historical and archaeological overview about Maresha, showing us fascinating pictures from the early 1900’s. Prof Gideon Avni of the Israel Antiquities Authority told us stories of grave robbers, destruction and discoveries of graves in the necropolis and then the star of the evening, Prof Amos Kloner, got up to give his address. With that the evening concluded and we took our bus back to Bar Ilan University for a good night’s sleep. 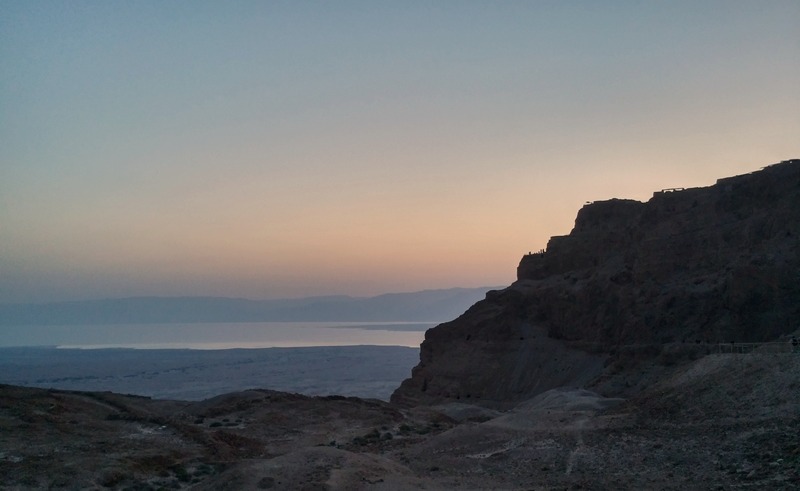 Just over a month ago the Mechina for Olim (a preparatory course for immigrants) in Bar Ilan University, which I am taking alongside Archaeology classes, provided us a trip to Masada and the Dead Sea. We amassed outside the university gate in the wee hours of the morning and boarded the two buses hired to take us on our trip. That particular night and morning thereafter had uncharacteristically thick fog, so dense that the driver was forced to slow down considerably. Driving in from the west, we traversed the barren wilderness and arrived at the parking lot beside the old Roman encampments on the west side of the craggy mountain. 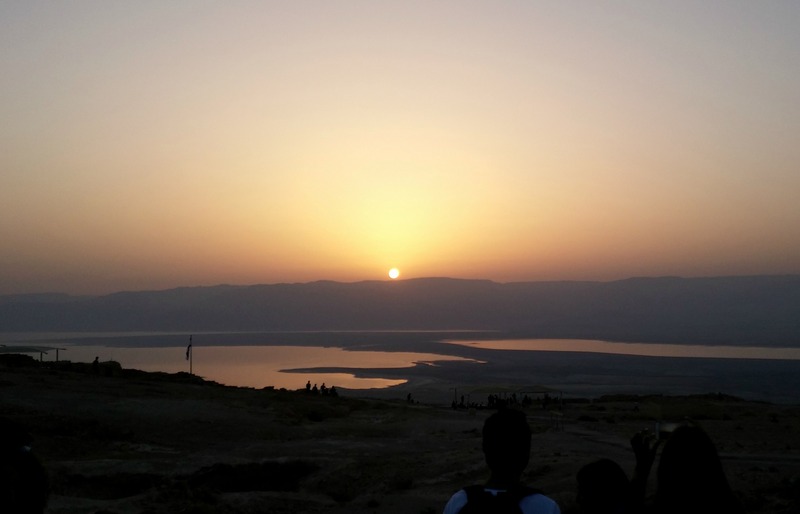 With the first hint of morning light showing over the horizon, beyond the Dead Sea and the mountains of Jordan, we began our ascent for the sunrise tour. 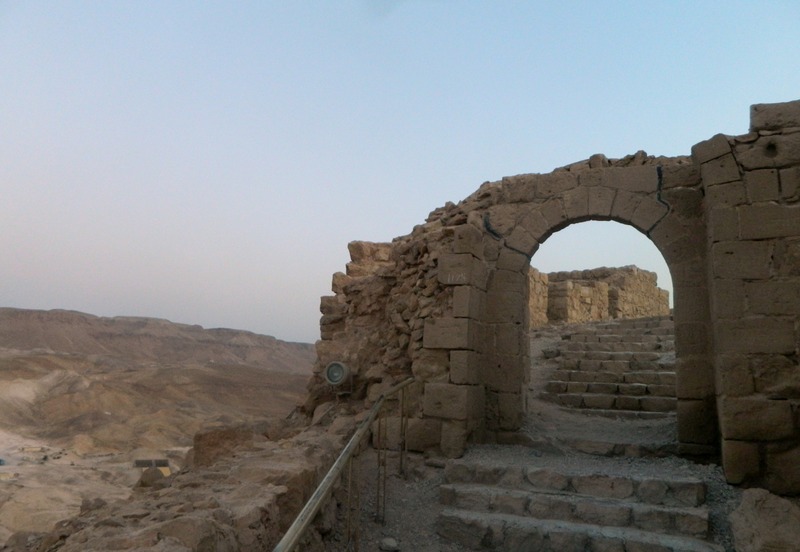 The history and archaeological work done to Masada, one of Israel’s most famous tourist attractions, is too much to cover for this post, especially due to the fact that there is so much I simply don’t know yet – I will have to endeavour to write a better post on a future visit. 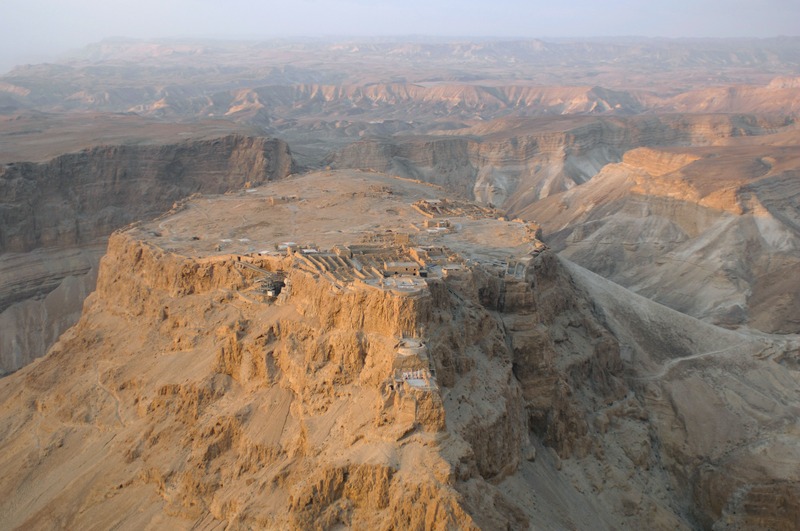 In short, Masada is the ruins of a nearly-impenetrable mountaintop fortress built by Herod during the Roman era nearly two thousand years ago. History was made at the end of the Great Revolt (or First Jewish-Roman War) as the fortress became the last standing bastion against the Roman army, after strongholds in other regions fell (such as Gush Chalav, Gamla and, of course, Jerusalem). We began our ascent up the Roman siege ramp (as can be seen on the right side of the aerial photograph), an extraordinary construction feat at the time, with the path straying from the ramp every so often until we reached the top. We entered the ancient fortress via a small arched portal and surveyed the flat mountaintop. The sun was creeping its way to the peaks of the Jordanian mountains to the east and we gathered around to watch the sunrise. With the world around us bathed in a new light we began our tour of the revered stronghold, one group in Hebrew and one group in French. Just as we began, the tours came to an abrupt stop, as we had approached the ruins of the ancient synagogue. We decided that there was no better place to hold the morning prayers (Shachrit) than in the synagogue of Masada. Unfortunately, my Hebrew-language tour carried on without me and so I ended up missing a lot of what was said. Having rejoined some half hour later, we explored the bathhouse, storehouses, administrative and residential structures on the northern end of the fortress before working our way back towards the centre of the complex. 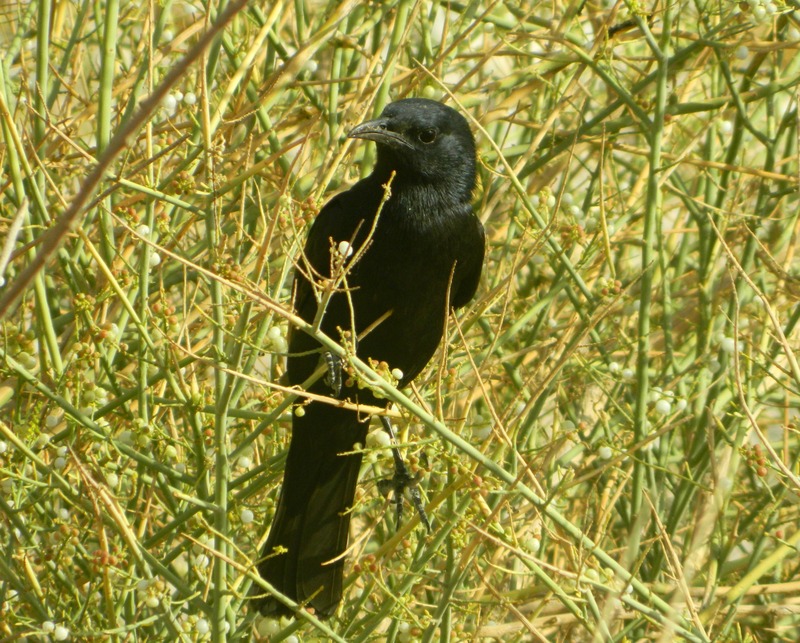 Several hours had passed and, although still morning, the harsh desert heat was beginning to pick up intensely. I wrapped my head in a white t-shirt and we began the descent down the famous Snake Path. Winding in the most serpentine manner down the east side of the craggy mountainside, the Snake Path is known to be the tough route up/down (especially when the third option is the cablecar). 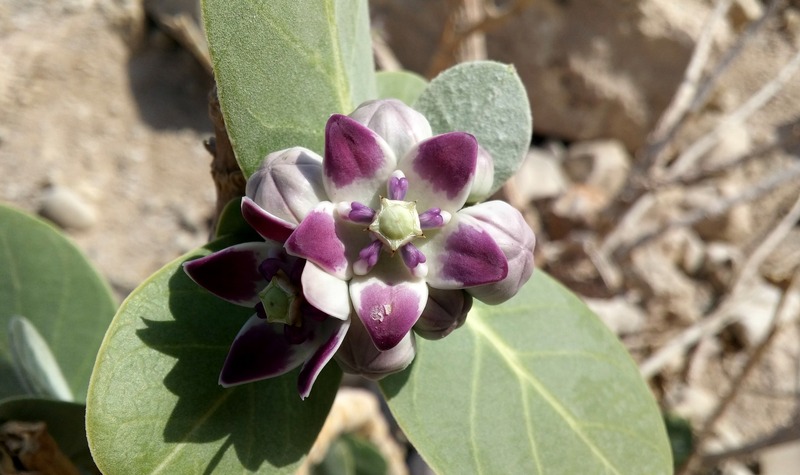 Along the way I spotted an interesting flowering plant and paused to photograph it. Upon future investigation I learned that it was a Sodom apple with toxic sap in their fruit. The fibres attached to the seeds of this plant were once used to make wicks and are explicitly mentioned in the listing of what materials are forbidden to make Shabbat candle wicks from. 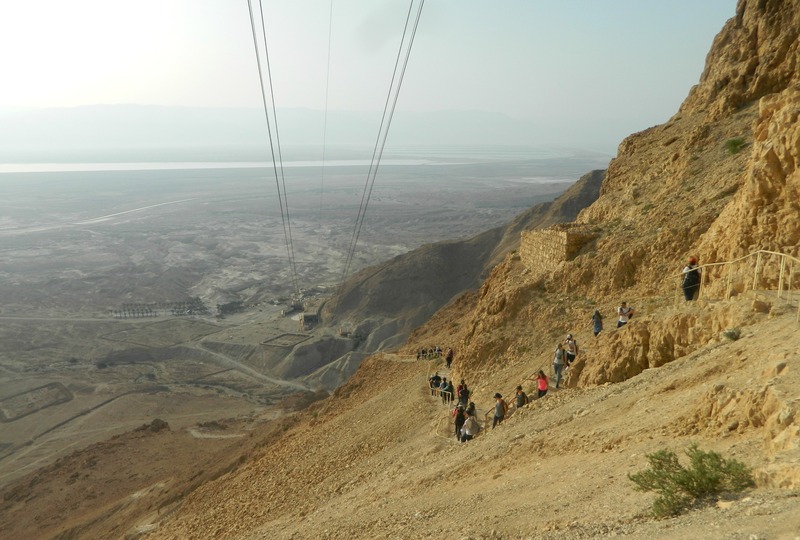 Eventually we reached the bottom and began our walk to the Masada Guest House where we were to have breakfast. I dug into a plate of salad, canned apricots and a potato boreka whilst enjoying a nice cup of coffee. Lounging around the hostel after breakfast, we waited for our buses to return to take us to the second half of our trip, the Dead Sea. Now, oddly enough, I had never been to the Dead Sea and, rather unfortunately, I had no bathing suit readily available to pack and I didn’t bother to procure one – I’m sure the opportunity to float weightlessly will come again. 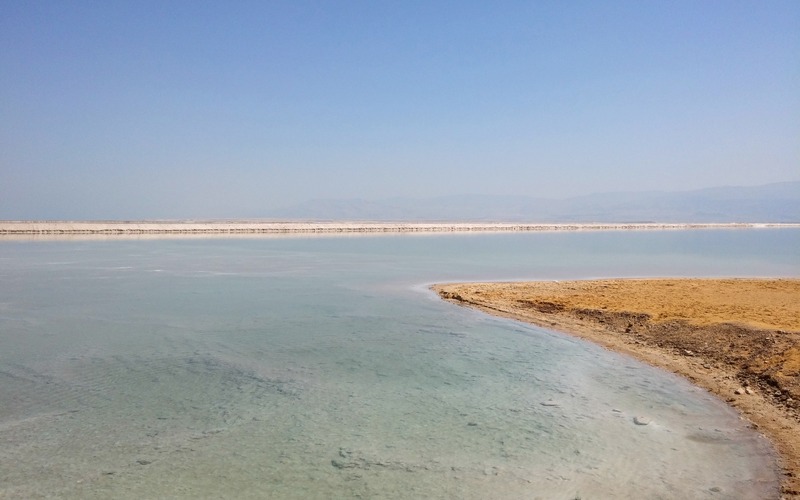 Without going into too much depth about the place, the Dead Sea’s water is 9.6 times as salty as standard ocean water, resulting in an unusual level of buoyancy. 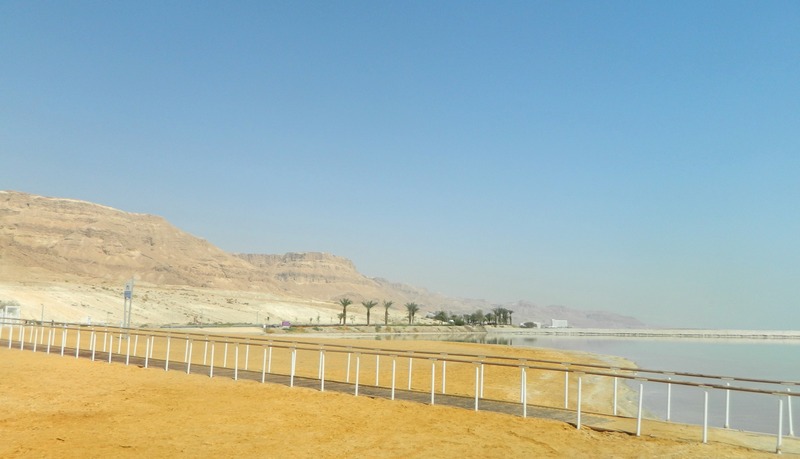 Additionally, the Dead Sea is the lowest place on Earth and incredibly hot all year round. Still wrapped in the white t-shirt I disembarked with my friends and colleagues at whatever resort area we arrived at (it might have been in Ein Bokek) and we made our way to the sea. Like newborn sea turtles we scampered our way across the hot sand to the inviting waters ahead. Some went in, some sunbathed at the water’s edge but I decided to inspect the curious salt growths, accompanied by two friends. We noted that ladybugs seems to be drawn to the salty sand, as well as a weevil which I caught on my finger. 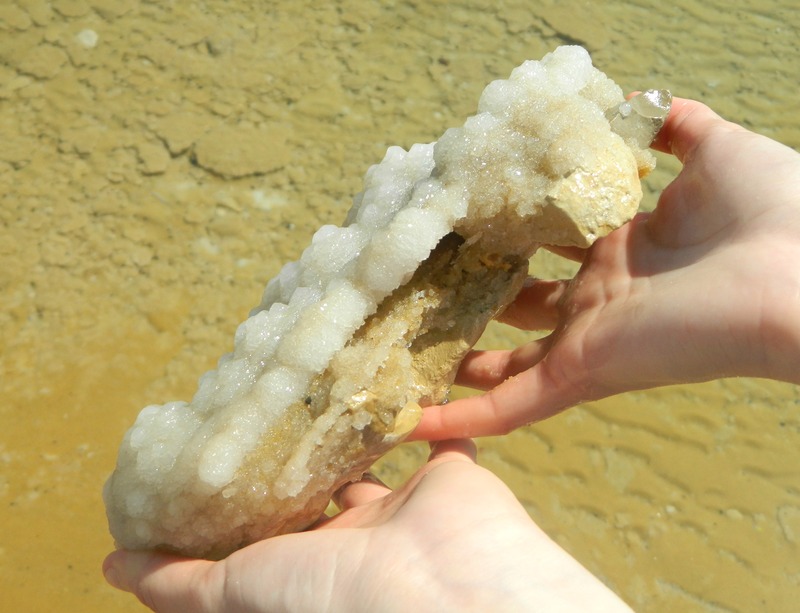 We fished out an interesting rock that was encrusted with salt crystals, as well as a twig that suffered a similar fate in the inhospitable waters. 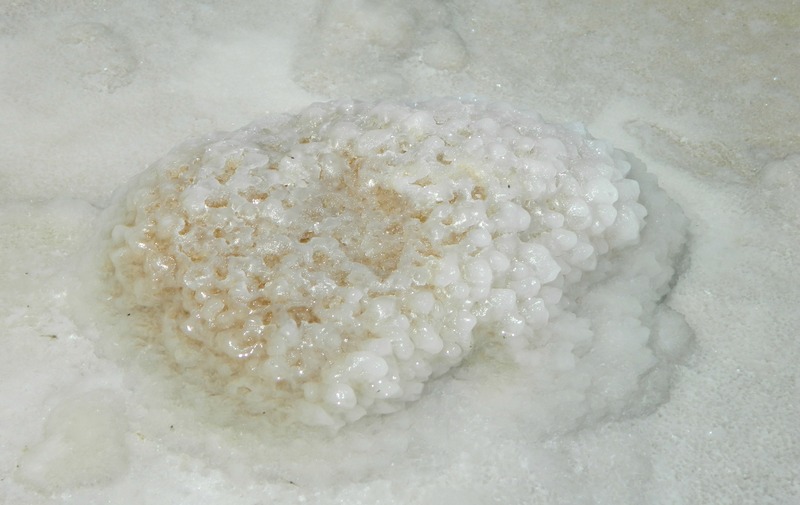 I’ve seen many pictures online of the most magnificent salt crystal formations in the Dead Sea yet we were on a touristy beach which continuously disturbed by the hands and feet of man. Baking in our clothes from the relentless heat, we turned back towards the resort and found shelter with comfortable padded chairs and couches. 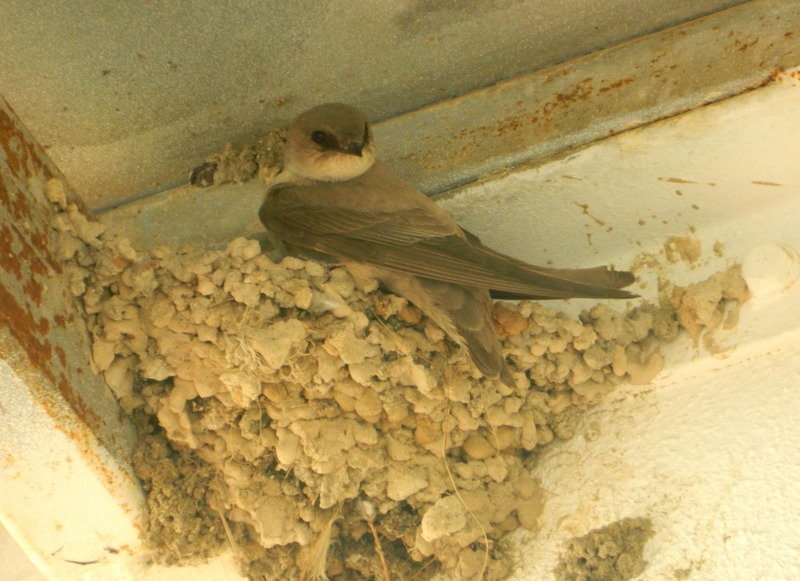 We relaxed and chatted in the shade, a pair of nesting crag martins keeping us company. After a lunch of sandwiches and fruit we boarded the buses and began the long journey back to Bar Ilan University, tired but happy with such a day of leisure and fun. 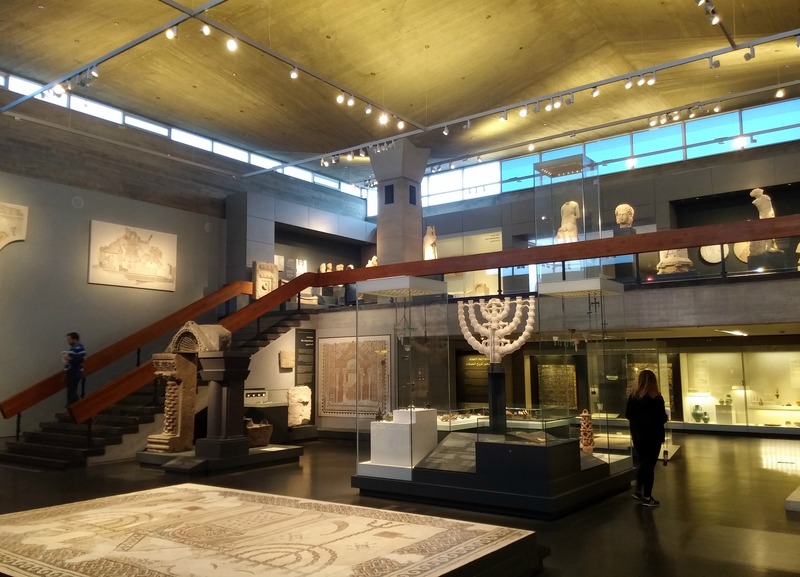 Several weeks ago I took the opportunity to visit the famed Israel Museum in Jerusalem, for the very first time. 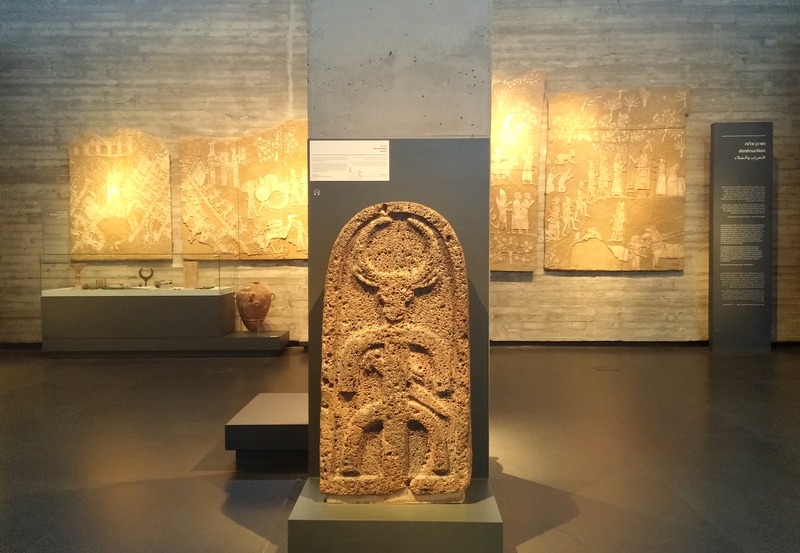 Not to be confused with the similarly-named Eretz Israel Museum in Tel Aviv, the Israel Museum is considered Israel’s national museum and is highly regarded worldwide. I bypassed a large group of soldiers and paid the necessary fee to gain entrance to the museum, excited to see what all of the fuss is about. Slightly confused with the layout, I first inspected an extensive, ancient mosaic floor from Bet Shean before heading to the archaeology wing. Beginning with Egyptian-influenced anthropoid coffins I took a self-guided, and very disorganised, tour of the section. If I were to relay a play-by-play review of my visit this blog post would be far too long and tedious, therefore, I shall simply list some of the items and exhibits that I found most interesting – highlights of my trip. Within the archaeology wing I found a small exhibition dedicated to ancient glassware, where I learned about iridescence in ancient glass, simple deterioration resulting in what is known as silver weathering. 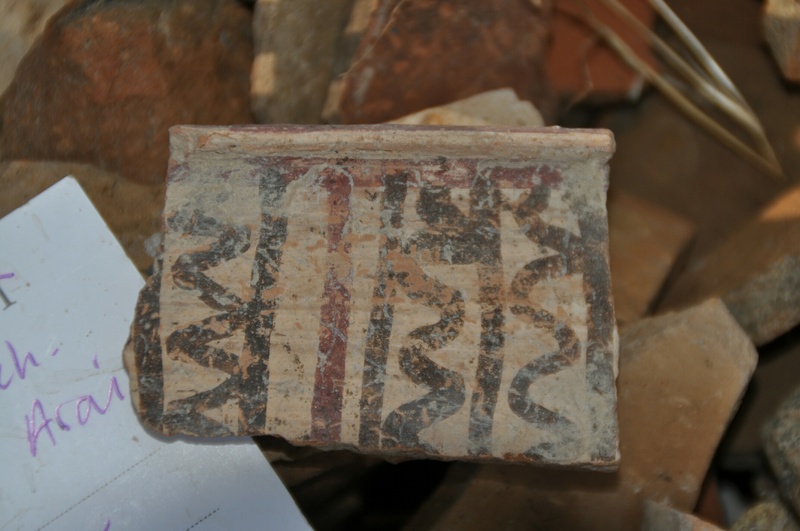 Moving along, I came upon a collection of painted clay ossuaries (burial chests) dating back thousands of years discovered in caves around Peki’in, just minutes from my house in Ma’alot. A copper crown and sceptre from the Cave of the Treasure in the Judean Desert caught my attention next, likely used in cultic ceremonies thousands of years ago. A collection of flint arrowheads from all over the country piqued my interest, as I am currently taking a class in technology and typology of flint tools. 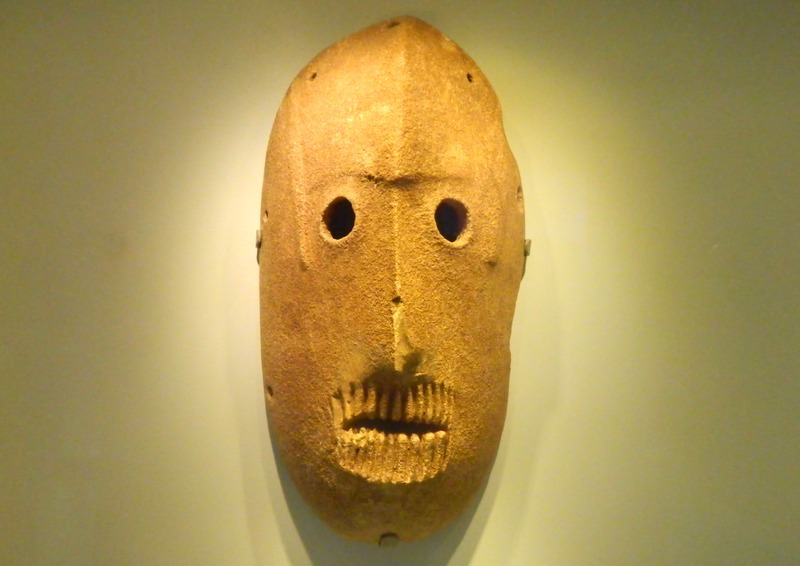 Next, a selection of ancient Tahunian masks made of limestone or chalk, believed to be the oldest masks in the world. Recalling my trip to the Ohalo site as mentioned in my first Kinneret post, preserved grains of wheat and barley as well as the reconstructed hut was on display in the same room. I then came across remains of ancient fauna, including hippopotamus, deer, tiger and ape bones and a set of horns belonging to an ancient bull. A full elephant tusk and molar brought back memories of the Golan Archaeological Museum where I had first learned about elephants roaming the Holy Land so long ago. 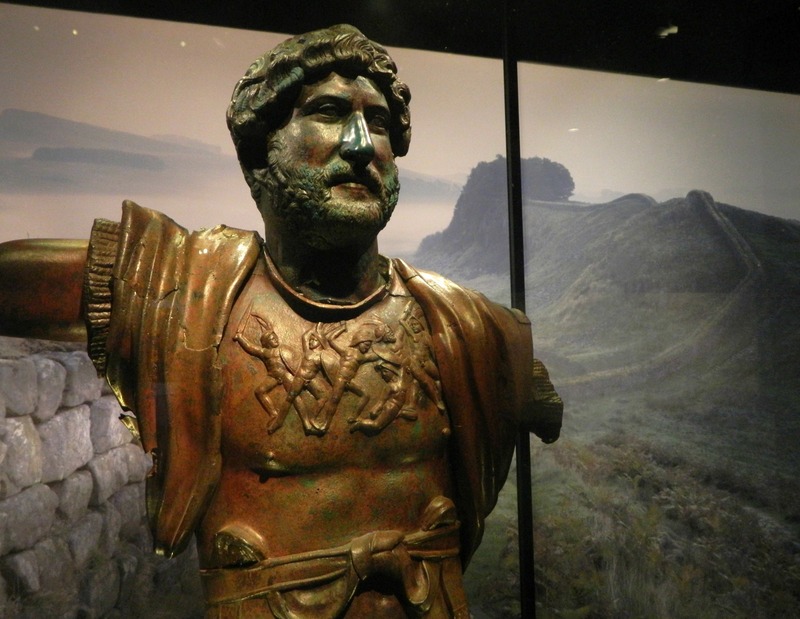 I entered a temporary exhibition on the Roman emperor Hadrian, and then found myself in another room looking at ceremonial dress of birth and death in different Jewish societies. I photographed a painted wood Torah scroll case from Maharashtra, India and then a wood and felt burial carriage from Hungary before continuing on to the next exhibit. Browsing the magnificent items on display from various foreign empires and cultures of antiquity I was surprised to see that the Israel Museum has such a rich collection of foreign artefacts, including a Akkadian bronze sword from Iran, a limestone relief featuring Iddin-Sin, King of Simurrun from Iraq, and ancient Egyptian funerary figurines of painted wood and stone – to name but a few of the fascinating items. But the local artefacts were also of great interest, including a stone inscription by Ottoman sultan Suleiman the Magnificent commemorating the rebuilding of the walls of Jerusalem in 1535-38, the same walls seen today surrounding the Old City. Entering a section dedicated to relics of the Crusader period, I found some wonderful things: a marble slab with the coat of arms of Sir Hugh Wake discovered in Ashkelon and a lithographic stone for stamping leather featuring the arms of the Grand Master of the Teutonic Order which was found in my favourite Crusader ruins, Montfort Castle. Articles of warfare from Tiberias and Akko were also on display, as well as a section of a Christian wall painting of plaster and pigment from a Crusader abbey in Jerusalem. It was at this point that my camera battery died and I was forced to continue documenting my trip with my phone camera, arguably better in terms of photo quality yet lacking any real zoom (which worked out okay for museum photos). I entered a two-storey room with idolatrous statues, painted tombstones and funerary busts from the Greco-Roman period on the top floor. Descending, I spotted a familiar mosaic on the wall above me – the mosaic from the ancient synagogue at Wadi Hamam that I visited not long before – visible, albeit blurry, in the above photo. With exhibits on Samaritan artefacts and ruins, ancient Jewish synagogue mosaics, the floor of a Roman dining room in Shechem (Nablus) and even the birth of coinage, there’s simply too much to write about and so I will continue on with the next selection of antiquities, including weapons of war from numerous empires, and the scatterings of pagan idols and idolatrous devices, such as an Edomite shrine found in the Negev. 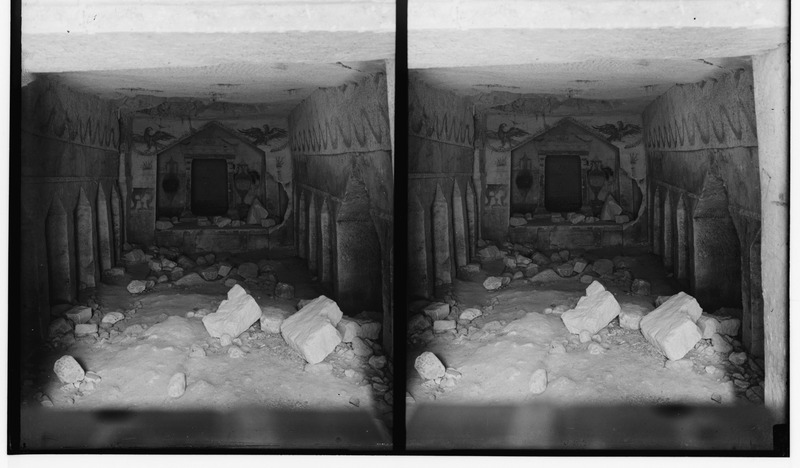 In the photo above, a carved basalt slab featuring one of two pagan gods was found just north of the Kinneret at the ruins of an Aramean city gate. Another object of interest was a silver goblet featuring an artistic mythological design that was found at Ein Samia, a site in the Shomron that I had visited just two days prior. 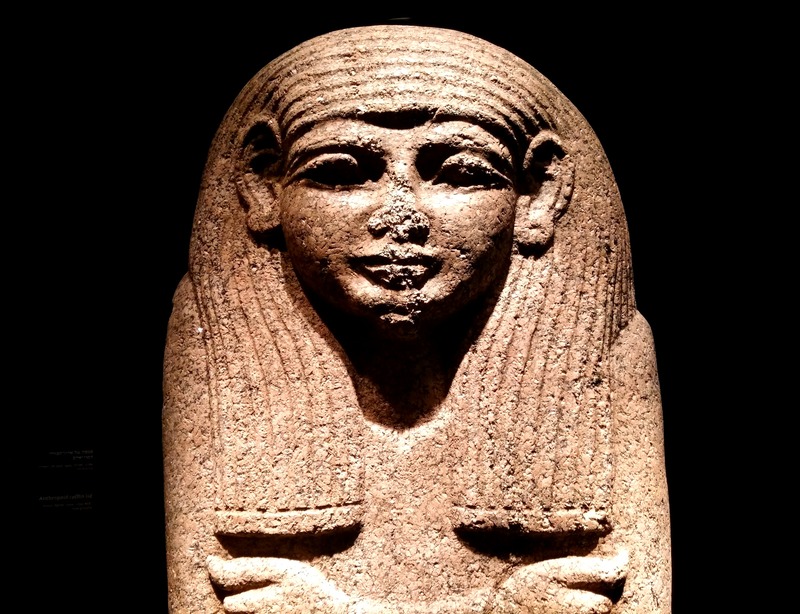 I then ventured across the main hall and entered a temporary exhibit titled “Pharaoh in Canaan: The Untold Story”, which I found quite interesting. 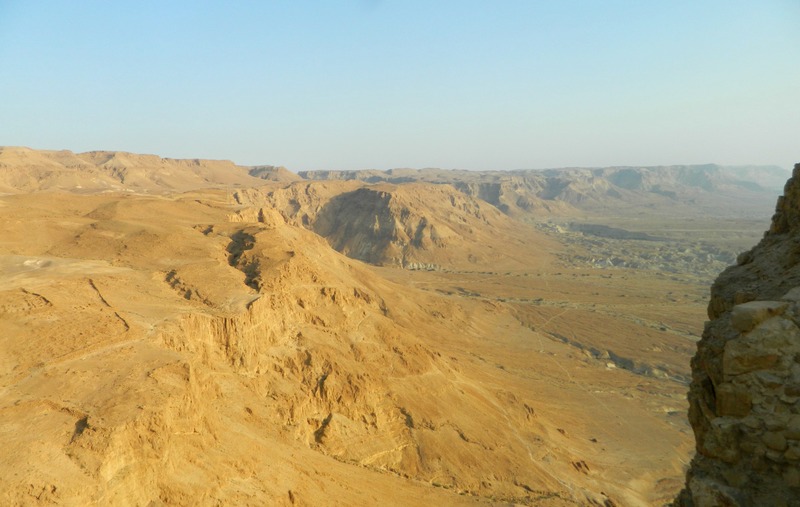 Having visited a large handful of ancient sites throughout Israel I have noticed traces of Egyptian rule, something which isn’t always addressed when it comes to the standard “who’s who” in Holy Land chronology. There is no denying the influence brought about by the Ancient Egyptian culture and, to further cement in their historical importance, compelling relics were put on display (including a reconstructed sandstone gateway façade of a fortress of Ramesses II in Yafo, or Jaffa). 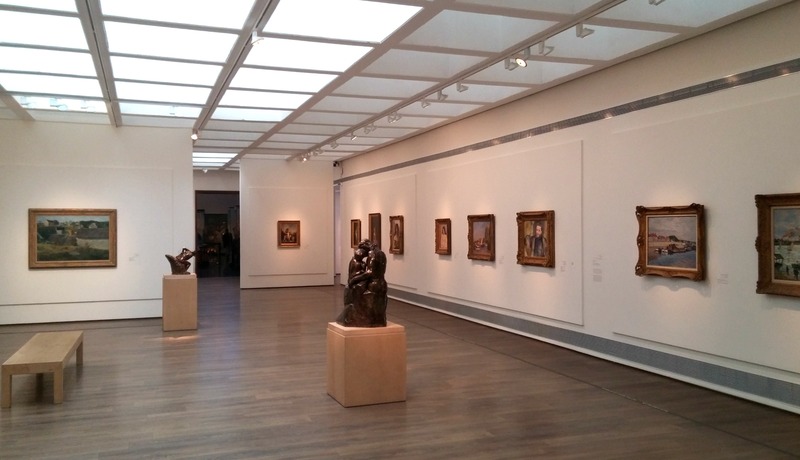 For fear of being too long-winded, I shall end the archaeological report here and focus on the other wings of the museum, starting with the Fine Arts wing where I found some agreeable works by Hodler, Van Gogh, Monet, Pissarro and Corot. I browsed the Arnold Maremont Gallery of Pre-Columbian Art (of which I had seen I very similar collection at the Detroit Institute of Arts several months prior), and then the exhibit “Costume and Jewelry: A Matter of Identity” which covers traditional dress of Jews the world over. Entering the Wing for Jewish Art and Life, I was blown away at the incredibly rich and extensive collection of all things Judaica. It’d be quite a difficult undertaking to even list the highlights of the exhibit so I shall simply cover my favourite section, “The Synagogue Route”. Featuring four reconstructed synagogues, each to a different degree of restoration, the section really interested me from a religious and cultural, as well as architectural, standpoint. I first entered the sandy-floored Tzedek ve-Shalom Synagogue from Suriname, a small Caribbean country in South America just north of Brazil. 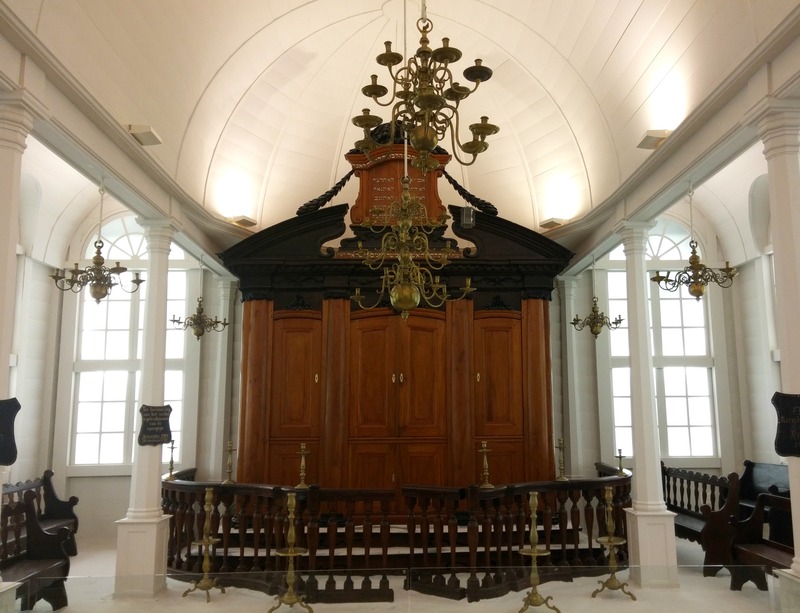 Built in 1736 by Portuguese Jews who lived in the Netherlands before starting a new life in the New World, the synagogue has influences from both European cultures. Next I visited the Kadavumbagam Synagogue from Cochin, India, with its large carved wood aron (holy ark) and balcony. In terms of opulence, it was the small yet grand Vittorio Veneto Synagogue from Italy which was completed in 1700 that took the proverbial cake – a masterpiece of Italian Baroque style, reminiscent of an aristocratic palace. The final synagogue is the Horb Synagogue from Germany, which sadly didn’t stand the test of time since being built in the early 1700’s. 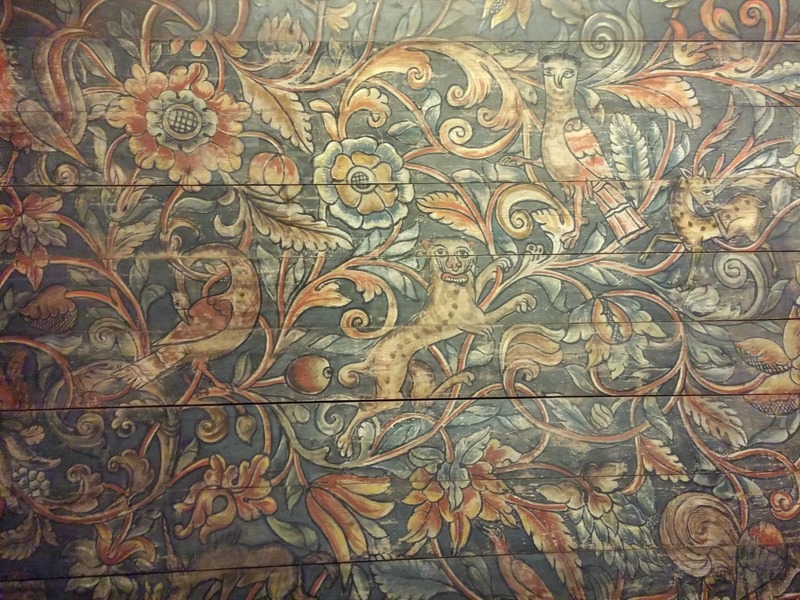 All that remains are the walls and elaborately painted wooden ceiling, dating 1735 by Jewish Galician artist Eliezer Sussman, which is the last surviving synagogue artwork of its kind. Leaving the phenomenal Judaica department, I walked, and at times nearly ran, through the ghastly contemporary art wing – only a mere few pieces holding any redeeming value in my critical opinion. 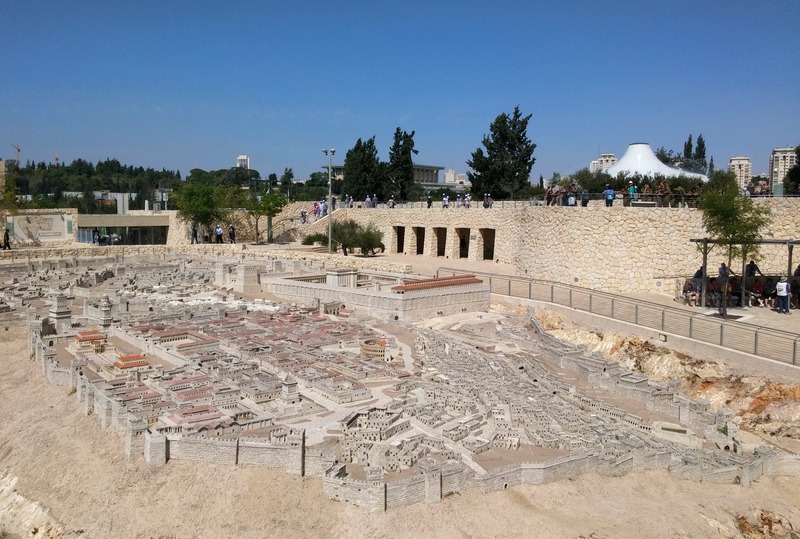 I dashed for the exit and passed some sculptures in the Art Garden outside as I made my way to the Holyland Model of Jerusalem, a 1:50 scale-model of what Jerusalem might have looked like during the Second Temple Period.